_The above symbol is instantly recognisable as the peace symbol, something that protesters against nuclear power and bombs will draw on banners, and themselves. But what are the origins of the this symbol? And what does it really mean? _We are told that a man named Gerald Herbert Holtom designed the logo using the above. The design was a combination of the letters "N" (two arms outstretched pointing down at 45 degrees) and "D" (one arm upraised above the head) of the flag semaphore alphabet, standing for nuclear disarmament. _However the symbol above is the Rune Agliz meaning: Literally: “Elk” – Esoteric: Protection, Higher Self. 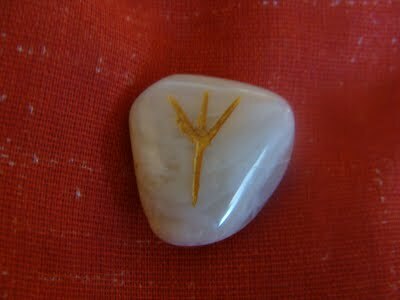 Rune of the essential link or connection with the patterns of divine or archetypal consciousness. Psi: Divinity, higher self, the state of listening. Energy: Protective teaching force, the divine plan. Divinations: Connection with the gods, awakening, higher life, protection. Strengthening of hamingja (personal gravity, ‘luck’) and life force through courageous deeds. Banishing the fear of death. When reading runes, if the rune is reversed, it means the opposite of when it is the other way up. Psi: Lower self, the state of not listening. Energy: Profane, harmful teaching force, the profane plan. Mundane: Unprotected, vulnerability, danger, negligence. Divinations: Connection with evil, unconscious, lower life, unprotected; or exposed danger, rejection by divine forces, loss of the divine link, fear. Strengthening of bad fortune through fearful deeds. Invoking the fear of death. So now you see the true meaning of the powerful symbol we have been told is about peace, but in fact is really making us live in a constant state of fear.